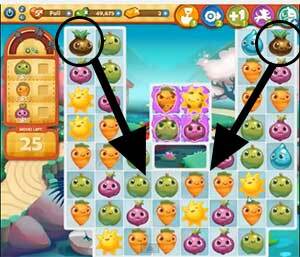 These Farm Heroes level 221 cheats and tips will help you beat level 221 of Farm Heroes. 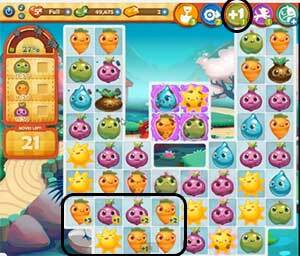 The objective of Farm Heroes level 221 is to collect 50 apples, 50 carrots, and 50 onions in 27 moves. 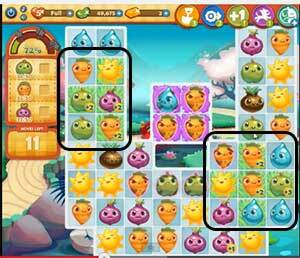 The level starts with a 2 seeds, one in each of the top corners of the board. You should try to move them down to the middle of the board. This way, when they turn to grass, there is a better chance that grumpy cropsies will land on it. More seeds do fall into play as the level goes on. This gives you a chance to make more grass squares. Grass not only turns grumpy cropsies, but also boosts points when matches are made on them, so use them for a better score. Since there is a lot of cropsies to collect in only 25 moves, you need to use the +1 booster. Theyput a +1 next to all of the required cropsies in the level. This makes it faster to collect your quota and thus beat the level.